The spliceosome is a dynamic RNA-protein machine which catalyses the removal of introns from eukaryotic mRNA precursors by two trans-esterification reactions (lariat formation and exon ligation) to produce mature mRNA with uninterrupted protein coding sequences. The spliceosome is assembled de novo around each intron from five large RNA-protein complexes called “snRNPs” (each containing either U1, U2, U4, U5 or U6 snRNA), and two large protein assemblies known as Nineteen and Nineteen-related complexes (NTC and NTR). The active site of the spliceosome is formed only after the fully assembled spliceosome undergoes extensive compositional and structural changes. How does the spliceosome assemble and carry out its function? How did a molecular machine as immense and complex as the spliceosome evolve in the Eukaryotic lineage? Our project aims to answer these questions by solving structures of the whole spliceosome at key steps by electron cryo-microscopy (cryoEM). U1 snRNP binds to the 5’ splice site of pre-mRNA and initiates the assembly of the spliceosome. The human spliceosomal U1 snRNP consists of U1 small nuclear RNA (snRNA) and 10 proteins. We have determined the crystal structure of the functional core of human U1 snRNP and revealed how U1 snRNP recognizes the 5’-splice site (Pomeranz Krummel et al., 2009; Kondo et al., 2015). U4/U6.U5 tri-snRNP is a 1.5-megadalton pre-assembled spliceosomal complex and represents a substantial part of the spliceosome prior to activation. We determined the structure of yeast U4/U6.U5 tri-snRNP by cryoEM single-particle reconstruction first at 5.9 Å resolution (Nguyen et al., 2015) and then at 3.7 Å resolution (Nguyen et al., 2016). We have been able to build a near complete atomic model of this complex comprising U5 snRNA, U4 snRNA, U6 snRNA and more than 30 proteins, including the key components Prp8 (Galej et al., 2013), Brr2 (Nguyen et al., 2013) and Snu114. The structure revealed how the Brr2 helicase unwinds the U4/U6 snRNA duplex to induce structural changes to activate the spliceosome. Recently we have solved a high resolution cryo-EM structure of the whole spliceosome captured immediately after the first step of catalysis (Galej et al., 2016). We have revealed the structure of this nearly 2MDa complex composed of 44 subunits including proteins and RNAs. Most importantly, the data allowed us to visualise for the very first time the pre-mRNA substrate just completed the first reaction inside the active spliceosome and its interactions with the RNA catalytic core and surrounding proteins. This has provided important mechanistic insights into RNA-based catalysis. More recently we have determined the structure of the spliceosome further remodelled for exon-ligation (Fica et al., 2017). This shows how the Prp16 helicase induces structural changes in the active site of the spliceosome to ligate exons to form mRNA with continuous protein coding sequences. Mechanism of 5’ splice site transfer for human spliceosome activation. Science, Epub ahead of print. Structural basis of Nuclear pre-mRNA splicing: lessons from yeast. A human postcatalytic spliceosome structure reveals essential roles of metazoan factors for exon ligation. Prespliceosome structure provides insights into spliceosome assembly and regulation. Postcatalytic spliceosome structure reveals mechanism of 3'-splice site selection. 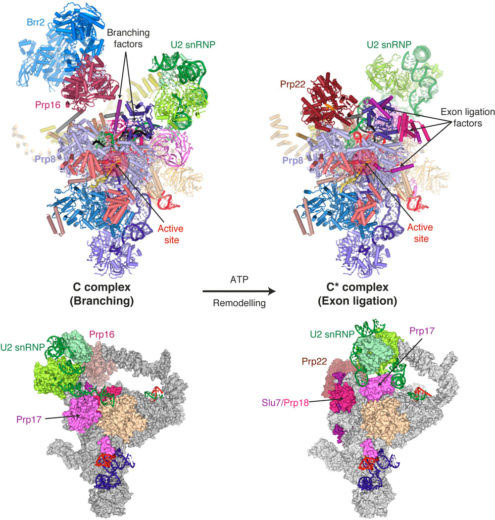 Cryo-electron microscopy snapshots of the spliceosome: structural insights into a dynamic ribonucleoprotein machine. Structure of a pre-catalytic spliceosome. Structure of a spliceosome remodelled for exon ligation. CryoEM structure of the spliceosome immediately after branching. Cryo-EM structure of the yeast U4/U6.U5 tri-snRNP at 3.7 Å resolution. The architecture of the spliceosomal U4/U6.U5 tri-snRNP. Crystal structure of human U1 snRNP, a small nuclear ribonucleoprotein particle, reveals the mechanism of 5' splice site recognition. Structural basis of Brr2-Prp8 interactions and implications for U5 snRNP biogenesis and the spliceosome active site. Crystal structure of Prp8 reveals active site cavity of the spliceosome. Crystal structure of human spliceosomal U1 snRNP at 5.5 Å resolution.